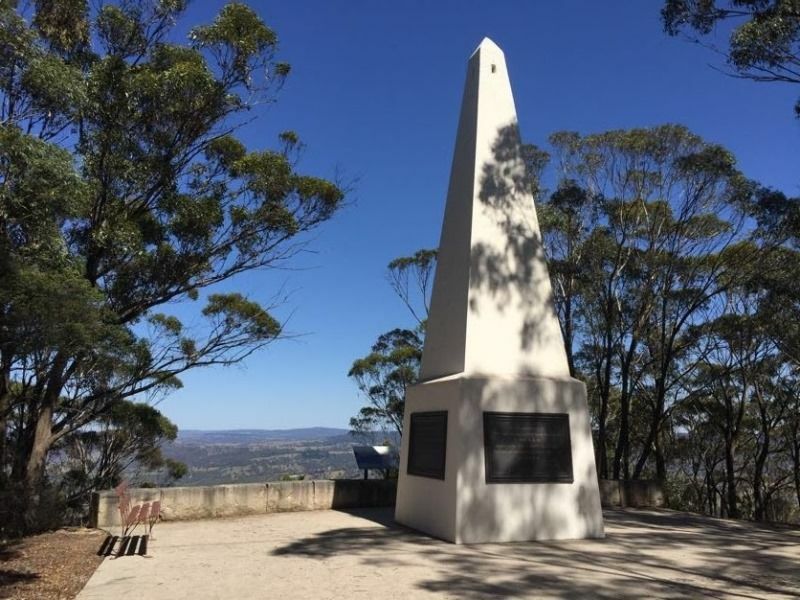 The Mount York Obelisk was erected by public subscription to commemorate the crossing of the Blue Mountains by Blaxland, Lawson and Wentworth in 1813. The obelisk was completed in 1900. 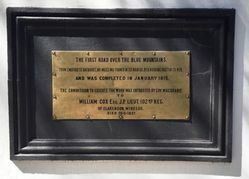 It was suggested that the obelisk should commemorate not only Blaxand, Lawson and Wentworth but also those others who had assisted in pioneering the route over the Mountains, including Evans, Cox and Macquarie. It stands towards the extremity of the mountain spur, just before the cliff line. The base of the obelisk has inscriptions on all four sides. These commemorate the Explorers, Blaxland, Lawson and Wentworth; the Surveyor, Evans; the Road-builder, Cox; and the Governor, Macquarie. The names of the Reserve Trustees at the time: Berghofer, Howell and Rienits, are also recorded on the monument. Blaxland, Lawson and Wentworth reached the area of Mount York on 28 May 1813, and camped at 'the edge of the precipice.' On 29 May 1813 they descended from the mountain 'through a pass in the rocks'. When building the first road over the Mountains, the construction of a descent from this ridge took William Cox and his road party five weeks between 7 November and 14 December 1814. 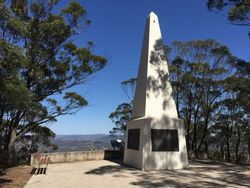 Mount York was officially named by Governor Macquarie in honour of the Duke of York (1763-1827), the second son of George III and commander-in-chief of the British Army from 1795 to 1827. The naming of this mountain by Governor Macquarie gave it prominent regal and vice-regal connections. 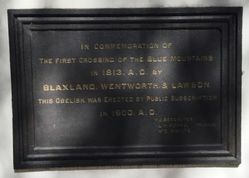 In commemoration of the first crossing of the Blue Mountains in 1813, A.D. by Blaxland, Wentworth & Lawson. This obelisk was erected by public subscription in 1900. A.D. 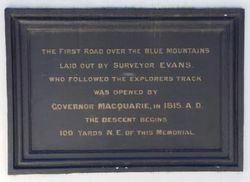 The first road over the Blue Mountains laid out by surveyor Evans, who followed the explorers track was opened by Governor Macquarie, in 1815. A. D.
The first road over the Blue Mountains. From Emuford to Bathurst, 101½ miles was formed in six months, by a working party of 28 men, and was completed in January 1815. The commission to execute the work was entrusted by Gov. Macquarie to Willam Cox Esq. J. P. Lieut. 102nd Reg, of Clarendon, Windsor.